This has been quite the year for Powell River Books and our float cabin to be in the news. It started with the Travel Channel for an upcoming show Extreme Houseboats. That was followed by an excellent YouTube video about float cabin living by Kirsten Dirksen of faircompanies.com. Several sites picked it up and created news articles including Business Insider and The Blaze. Then there was the interview and article for the Huffington Post. To cap it all off, reporter Kierra Jones of the Powell River PEAK came out to the cabin for an interview and to take some pictures. We picked Kierra up at the Shinglemill Marina for lunch with us at the cabin and an onsite interview. This week her article "Lutzs love life up the lake" was published. Were we surprised when we got our copy of the PEAK and found ourselves on the front page, both online and in print. This year the blackberries have been exceptionally big and juicy. Each time we head up the lake, I pick a some from the bushes in the Shinglemill parking lot. They come in waves, so there've been lots for the picking. My cupboard was bare, so I decided to make some blackberry. I used two resources to make my jam. 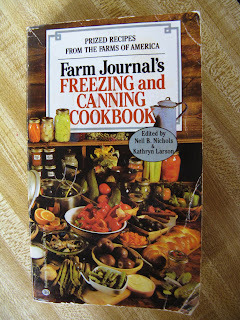 The first was a book I found at Kingfisher Used Books here in Powell River, the Farm Journal's Freezing and Canning Cookbook. I got mine used for $3.95, but they are much pricier online. I also used the directions from the Certo Pectin Crystals box. Yields about 8 cups. Do not double the recipe. Thoroughly crush berries. You can remove some of the seeds if you wish, but I like them included. The Farm Journal cookbook recommended lemon juice, so I added two tablespoons of fresh squeezed to the berry mixture. Mix the crushed berries and the Certo Pectin Crystals in a large pan. Bring to a boil over high heat. Then add the sugar all at once. Return it to a hard boil and let it boil for one minute. The cookbook says to be very accurate, so I used my timer. Remove from heat and stir and skim for five minutes. Pour into warm, sterilized jars to 1/4" from the rim. I used 250 ml (8.5 oz) jars. Wipe the tops clean of any spilled jam and place sterilized lids and screw caps on, making them finger tight. The Farm Journal book recommend five minutes of processing in a boiling water bath (the lid was off only for the picture), so that is what I did. I've never seen a turtle in Powell Lake. But this summer when our good friend John brought up a large rock from the bottom of our natural swimming pool, that was my first thought. On a lark, John left the heavy rock sitting on the stump that rises from the middle of our pool during dry months. I took out our float called Utopia, loaded up the heavy rock, and brought it over to the cabin deck. I got out my acrylic paints and started to bring out its inner turtle. Wayne was a bit skeptical when I started. He joked it looked more like Kobe Bryant's basketball shoe. So now, his name is "Kobe the Turtle." After several coats of clear acrylic spray to seal the paint, Kobe is ready to take his place of honour on a cedar stump on our cabin's transition float to shore. Here he'll be able to bask in the sun and remind us of summer days all year long. As we were coming down the lake on Tuesday to pick up a reporter from the local PEAK newspaper, the clouds in the sky look just like corduroy cloth. Wayne (my resident weather expert) said it was a form of Mackerel Sky, altocumulus clouds hinting at possible rain. On our way back up the lake, they persisted, but with a little less definition. On a remote lake in Canada, Ashley and Justin live off-the-grid. But their idyllic life is interrupted by two mystifying anomalies. A distant galaxy exhibits unusual characteristics in Justin's amateur telescope, and something under the lake is stirring. Can a determined woman bring clarity to the events that are rapidly unfolding? This summer we decided to keep our quads near the cabin so we can use them more often. Last week we took a ride west of Powell Lake. 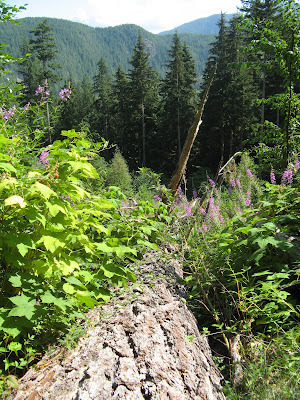 To leave Hole in the Wall, we followed an overgrown track to more recent logging roads leading towards Chippewa Bay. This area has log booms, a dock for work boats, and a barge ramp for heavy equipment. 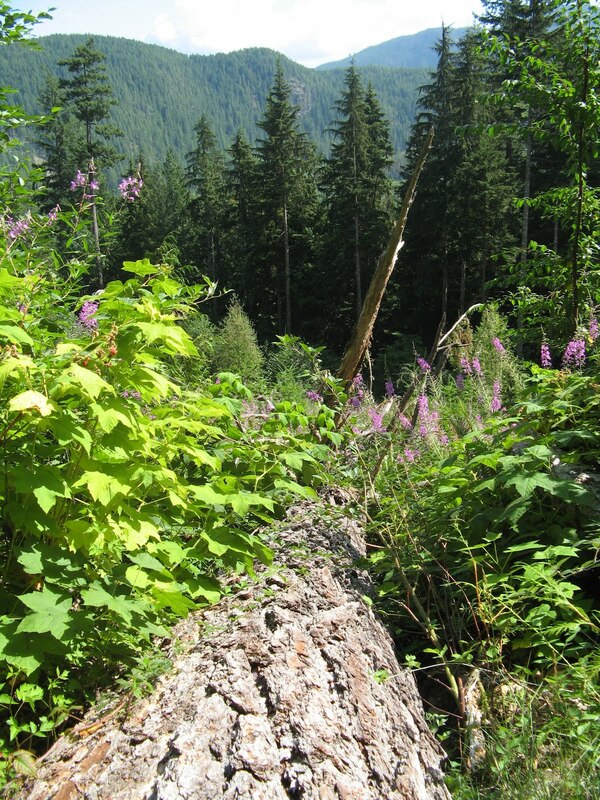 Logging has been active here since the beginning of the 20th Century. A side road is called Museum Main. It leads up from the dock on Powell Lake to a historic logging area where steam donkeys were once used as the power to haul logs out of the bush and down to the lake for transport to market. The logging road passes two donkeys, hence its name. But as we headed up the main, we encountered an obstruction larger than normal. We get some wicked winds up the lake during winter storms. What do you think it sounded like when this old giant split from its roots and fell? I've been watching Bullfrog pollywogs grow in our natural swimming pool at the cabin. When I first saw them, they had no legs. Just very large tails. Then back legs started to grow. From little bumps, they matured into legs with webbed feet perfect for swimming faster and deeper. About two weeks later, here's what I found. I call it a pollyfrog. All of the legs have matured and from the front it is very frog like, except still a bit pudgy. Taking off on Powell River Airport's Runway 27, the Historic Townsite spreads out below the wings of my Pacific Coastal Airlines plane. It's water, cool, clear water. Over the last three years I've been conducting an experiment with carrots. To be honest, the first year wasn't planned but it was crucial to the result. In Spring 2010, I planted Scarlet Nantes carrots from commercial seed in my float garden. I like Scarlet Nantes because they have short, stocky roots. By late summer, I can start harvesting, and they last in the ground through winter. 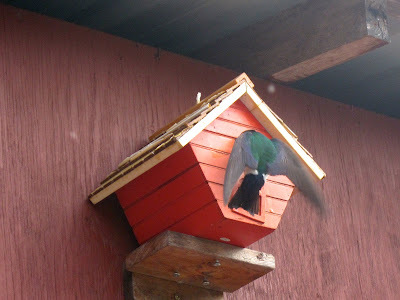 But in September 2010, Mom had emergency back surgery and I didn't get back to the cabin until late January 2011. The carrots were still good to eat, so I left them in the ground. 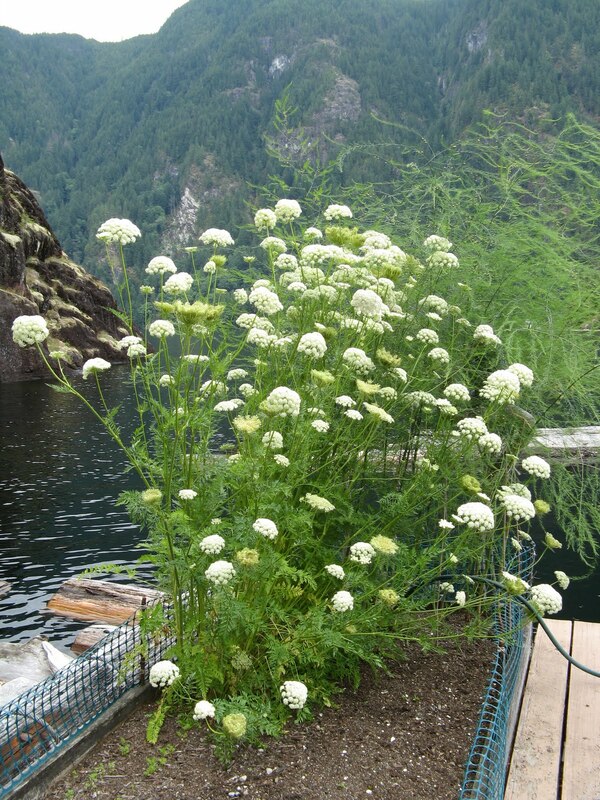 When spring 2011 rolled around, the carrots grew tall flower stalks. I decided to let them go and see what would happen. Once the flowers started to dry, I covered some of them with cheesecloth to capture the seeds. That wasn't necessary. I was able to save lots of seed just by cutting the dried flower heads. In addition to the seeds I saved, there were lots that fell directly onto the soil. I left the extra seeds in the empty bed and dug them in to see what would happen the following spring. This year, the seeds grew into nice, large, crisp carrots. I would say my experiment with "carrots gone wild" and seed saving was a success. Recovering from "Attack of the Tent Worms"
Last June, in "Attack of the Tent Worms" I shared the devastation that Tent Moth caterpillars caused here in Powell River, BC. For some unknown reason, every 5-10 years there's a population explosion. And this was our year. They prefer to eat the leaves of deciduous trees. In our case, the alders took the brunt of the attack. Alder trees grow almost like weeds here, especially after logging companies cut down a new tract of mature firs and cedars. 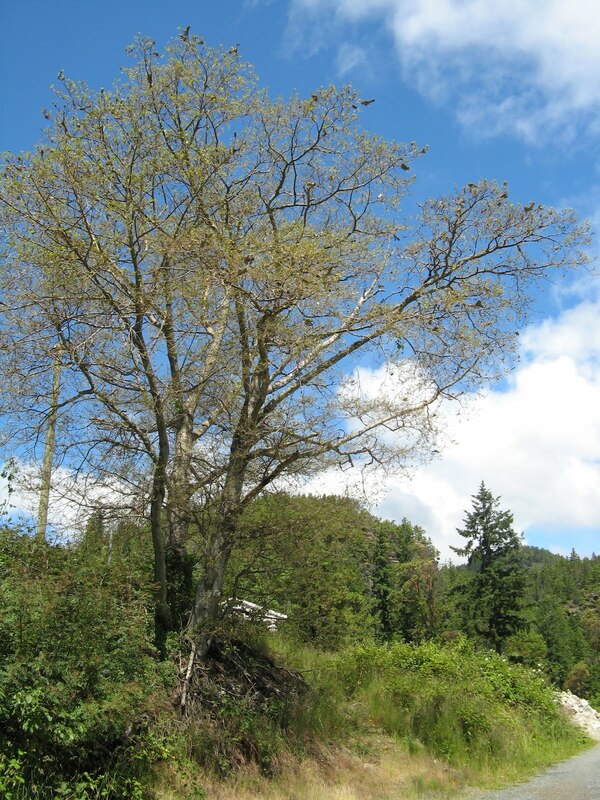 After vines and small shrubs, it's the alders that naturally reclaim the barren soil. They gave the caterpillars an abundant food source. Tent caterpillars, and the subsequent moths, are named for the structures they build for protection while not eating. Here's an alder in the parking lot of the Shinglemill Marina on Powell Lake. You can see what the caterpillars voracious appetite can do in just a few weeks. The dark spots you see are the tents attached to the now bare branches. They say a healthy tree can withstand such an assault when the six weeks of munching are finally through, and the caterpillars enter the pupa stage. Hey, wake up, it's time to fly. Aw, ma, can't we just hang out here a little longer and have a few more of those bugs before we go? After a long, wet spring and early summer, we've finally started into a nice summer warm spell. Then after a week of sunny, cloudless skies, the weather changed. Clouds rolled in and the air became muggy. At sunset, a brief shower began with large drops pelting down on the lake. You could see the storm "walking" across the surface on its way to our front porch. 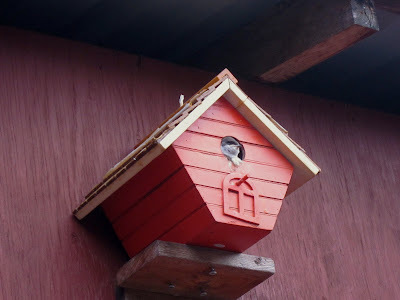 I've shared how we like to recycle, reuse, and repurpose at the cabin. It saves money, but also keeps things out of the trash. Yesterday, I practiced what I preach on a very small scale. I took some kitchen scraps out to a bucket on the transition float. I keep it there while waiting to go up the hill to the compost pile. I looked down through the cracks in the deck and saw two eyes staring back up at me. We get some interesting flotsam, but this item was securely wedged under the cedar log float. I reached down and wiggled it out through a small opening. To my surprise, it was Uncle Whale. He was a swimming pool toy similar to a rubber ducky that we tied to the transition float way back in 2002. One result of the excellent video about our float cabin by Kirsten Dirksen at faircompanies.com was a call from a reporter at the online news site, the Huffington Post. 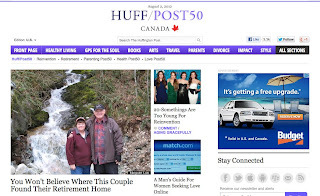 After a phone interview, an article was posted at Huff/Post 50. Off the Grid: Wayne and Margy Lutz Find a Retirement Home in a Float Cabin was written by Anthonia Akitunde. At first I was excited, but then I was shocked at some of the uncaring, and sometimes downright nasty, comments. I understand that living in a float cabin isn't for everyone, but personal attacks seemed uncalled for. Canadian Tire has a sale this weekend (Friday through Sunday) on their MotoMaster Eliminator 2-in-1 Spotlight/Lantern. Normally costing $39.99, we got two more at only $11.99 each on sale. That's $16.01 less than the cost of one. We like them because they are rechargeable and have very bright LEDs. If you miss the sale, keep watching. They seem to run this offer several times a year. It's called 2-in-1 because it's both a lantern and a spotlight. The lantern uses five LEDs and runs for up to 15 hours on a charge. The spotlight uses a halogen bulb and runs for about 2 hours on a charge. It comes with both a DC cigarette lighter charger and AC plug. You can stand it on a table for a lantern, use the handle for a spotlight, or hang it from the built-in handle to light a room. It's quite versatile, and no batteries to buy. That's even more savings. At the cabin, we use one of the lights hanging in our kitchen. After dark, it really lights up the space. That saves our cabin battery bank, especially in winter. The other I use over my shoulder on the sofa as a reading light. In the spotlight mode, it gives plenty of light and lasts for several hours of reading pleasure. Last week I wrote about Wayne's Laser sailboat. Then on Tuesday I was walking the docks at Squalicum Harbor in Bellingham and saw a whole rack full. Lasers are pretty small to have names of their own, but I bet Wayne dubs his "Mr. Sailboat" pretty soon.